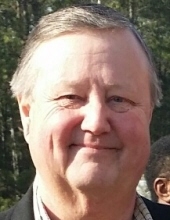 Celebrating the life of John Lewis Oxley, Jr.
Obituary for John Lewis Oxley, Jr.
John Oxley, age 57, of Madisonville, passed away suddenly Sunday, December 2, 2018 at his home in Madisonville. Funeral services will take place 11 A.M., Thursday, December 6, 2018 at the Madisonville Funeral Home in Madisonville. Jim Dickson will officiate the service and interment will follow in Mt. Tabor Cemetery. The family will receive friends Wednesday, December 5th from 5 P.M. to 7 P.M at the funeral home. John Lewis Oxley, Jr. was born May 20, 1961 in Madisonville, Texas to parents, John Lewis, Sr. & LaVerne (Schaffner) Oxley. He was a graduate of Madisonville High School and Sam Houston State University and the owner of John L. Oxley, Jr. Insurance Agency in Madisonville. He enjoyed fishing, hunting and cooking. John had lived most of his life in Madisonville and was a member of First United Methodist Church in Madisonville. John was preceded in death by his father, John Oxley, Sr.; mother-in-law and father-in-law, Patricia and Vincent Funk; sister-in-law, Stephanie Walsh and godfather, Joe Hughey. He is survived by mother, LaVerne Oxley; wife, Cindy Oxley; daughter, Jennifer and Daniel Fincher; step-daughter, Christina and Alan Baccus; sister and brother-in-law, Lori and Lee Burton; brothers-in-law, Louie and Mary Funk, Wendell and Kim Funk and Pat Walsh and nephews, Sebastian Hargrove, Nathaniel Funk, Jake Baker, Kyle Funk, John Cuyler Burton, Cannon Burton and Callum Burton. In lieu of flowers, memorial donations may be made to First United Methodist Church, 102 South McIver, Madisonville, Texas 77864 or Rufus Refuge, P.O. Box 1385, Madisonville, Texas 77864. Madisonville Funeral Home in Madisonville is entrusted with final arrangements. To send flowers or a remembrance gift to the family of John Lewis Oxley, Jr., please visit our Tribute Store. "Email Address" would like to share the life celebration of John Lewis Oxley, Jr.. Click on the "link" to go to share a favorite memory or leave a condolence message for the family.